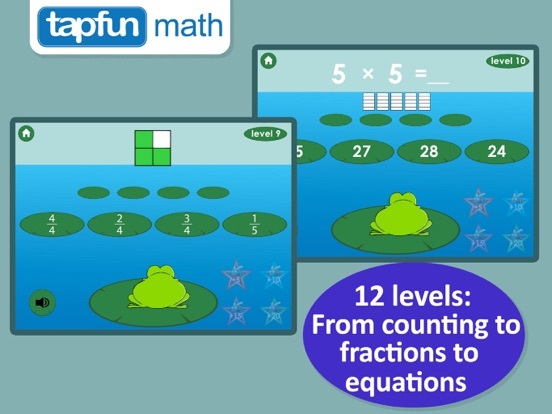 Fun Math Problems Pro by Tapfun Inc.
Frog Hop challenges kids aged 3-7 to develop their word recognition skills and improve their math abilities. After completing each level, feed your hungry frog as many flies as you can in 30 seconds! 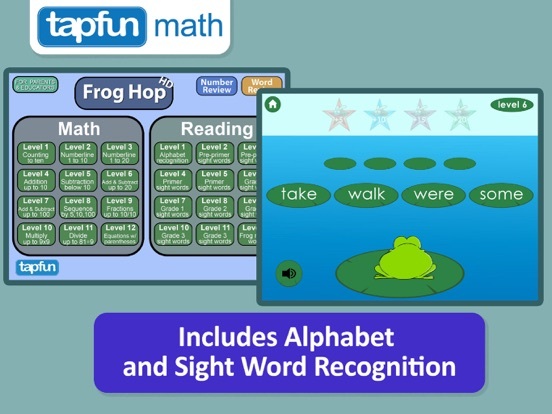 The word levels include all 220 sight words and a final level includes frog related words such as tadpole and water. 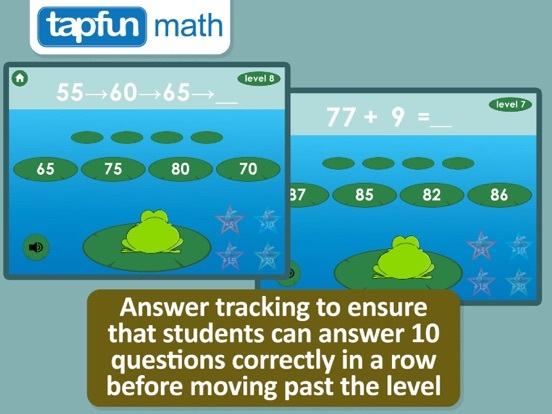 For both word and math play, the level design ensures that the child can answer 10 in a row correctly before moving forward. 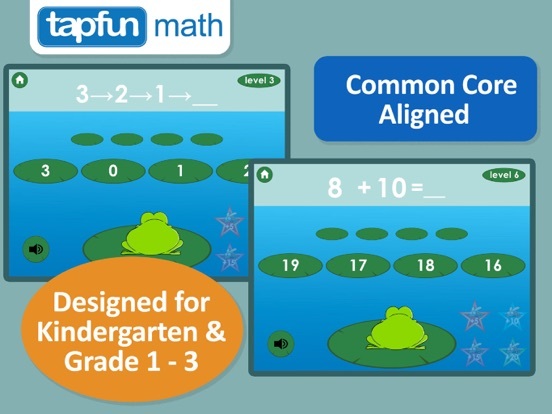 This design is being made more popular by the Khan Academy and helps to ensure that the kids truly understand the material. 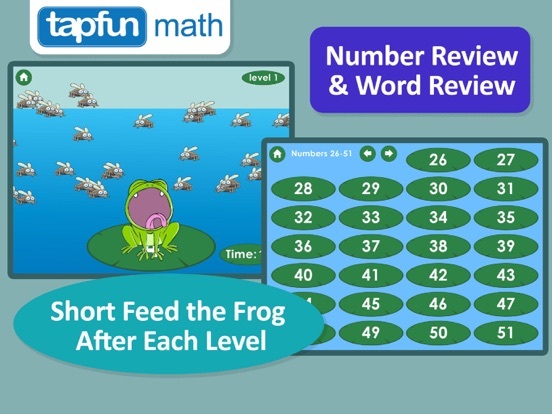 The reward at the end of each level is a frog feeding frenzy! Drag the flies to the frog's mouth and he will do the rest. 5 flies can be dragged at once from anywhere on the screen so go fast and find out what happens if you feed your frog 45 flies, he might just double in size! You will notice that the better your child does on each level, the more flies they will get at the end of the level. At a minimum, there will be 15 flies available. Have any ideas on how we can make this better? Be sure to contact us. Also, please review the app if time permits. This helps us spread the word. Thank you! Sight word acquisition is a critical building block for any child's ability to read. For example, once he or she can read all of the words on Dolch’s lists, they will have access to 75% of what is printed in almost any piece of children’s literature. The more one-on-one time a child has learning and practising sight words with an adult, the greater his chances to integrating them into his long-term memory. Encourage your child to read the words out loud when they press on the answer. We have improved the performance of the app. Thank you for your support.